Hey friends! Hope you're having a good week! I'm still dealing with a cold, but all things considered, I'm ok! I wanted to write a quick blog on something I know I've mentioned before... but I thought it deserved more explanation. I think we've all tried foundations that weren't quite right for us. A common scenario for me is that I'll love the look of a foundation when I first put it on, but then it looks not so good by the end of the day. For the news, I need both coverage and staying power... and there's a certain foundation that can give me just that! Combine foundations first- Sometimes I'll just tap a little Colorstay on my hand along with a second foundation, mix them together, and then apply them all over my face. Pre-contour on the face- My color in Colorstay (Fresh Beige) is often just a bit light for my skin tone. So sometimes- with my finger- I'll just dot the foundation in areas I want to highlight- down the nose, center of the forehead, under the eyes, and chin. Then I'll apply a different foundation on my temples, jaw, etc. After that I use a brush (usually the Sigma F80) to blend over the Colorstay portions and then the other areas. The result not only looks blended, but really natural due to the color variation. In some cases, these are foundations that don't have very good staying power or coverage, but in terms of Revlon PhotoReady and Neutrogena Healthy Skin... I think these are good foundations on their own, but I like how they balance out Colorstay. The end result with all of these combos is a look that keeps looking fresh at the end of my work day. Thanks for reading! Spent a lot of the afternoon editing a video that I thought would be so simple! I've noticed I have a tendency of getting big ideas and making things complicated. Hopefully it's cool when I finish & upload tomorrow! I recorded the Robin Roberts "In the Spotlight" special she did on several country music stars. Just watched it & really enjoyed it! I find this whole Penn State sexual abuse scandal so disturbing and disappointing. Time to take another cold pill & get some rest. I know your into foundation, so I thought I ask you for advise. I have problem finding a foundtion for my skin! I have very dry and sensitive skin (eksem). Do you recommend any for my type? I will have to try this out with my Colorstay! THanks! Hi Emily! I love your tutorials and you tube videos. can you show your foundation routine---showing how you use two different shades and foundations in order to see how you contour/highlight . thanks ! I spritz my face with MAC Fix+ then apply Colorstay. It makes it last even longer (amazing right..it's possible) and go on much thinner but is still full coverage at the same time. Same idea as using a wet sponge but the way if affects the staying power is crazy good. Thx Emily! I have bee a loyal fan of Revlon Colorstay for YEARS!!! I've just started using it with Neutrogena Healthy Skin foundation and it's perfect; it's not as thick and "cakey" looking. I use this trick too! I've mixed it w/ Revlon PhotoReady, Estee Lauder Double Wear (actually makes DL a bit lighter and not so heavy) and Missha M Signature Real Complete BB cream. I've tried Colorstay in the past and have migrated to other foundations but the idea of mixing it with another (currently I use L'oreal True Match) is a great idea. I will have to give that a try! I love combining Revlon colorstay with mehron hd creme foundation. It gives unbelievable coverage! Great tip, Emily! Revlon Colorstay is my all time favorite liquid foundation! I work long days in an office and don't usually have time for touch ups throughout the day. This is the only product that seems to last on my oily skin. I'm definitely going to try mixing it with my other not-so-longwearing foundations! I love mixing two different shades of Revlon Colorstay. I also love mixing colorstay with rimmel matte finish, laura mercier oil free, several different bb creams, and sometimes even tarte amazonian clay foundation! I totally agree with the Penn State thing and have been following the story closely and find it more and more disturbing the more I learn. Thanks for the foundation tips and helping to keep us all beautiful! 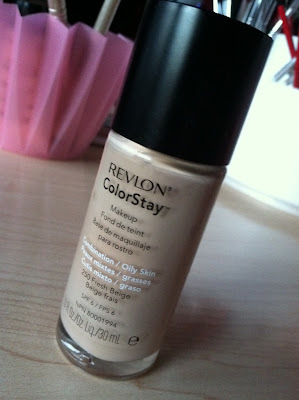 Revlon Colorstay is one of my favourite foundations too. Thanks for the tips! I love this foundation! I tend to wear it a lot in the winter months, because my skin gets a lot drier! I have been trying the rimmel 25 hr foundation, would that be something that could be added with the revlon colorstay? the colorstay is the other one i wanted to try also. i would love to see you demonostrate the two in a vid to see exactly how and where you put each one. thanks so much Emily. Would you use the dampp sponge for the PhotoReady foundatio as well? I need to get another bottle of this. I feel like I'm chronically on the search for a good foundation, and when I find it, I keep looking for something else. Lord I wish I could wear liquid foundations, but everyone I've tried - even ColorStay slides right off my face by lunch. Great idea to mix with no-so-good foundations. At least not throwing money down the drain. Sorry about the cold. Everyone down here (Alabama/Georgia) is fighting everything. Stay hydrated! I have been using this method for a while and I love it. Loreal True Match alone wasn't even close to being great but during the summer I wanted to have a slight glow and tried this with my Colorstay foundation and I am in love with Loreal True Match now! This is the best little discovery I have tried in a long time. I use this Revlon foundation in the oil free version on all of my super oily clients bc the staying power is so good and it doesn't break my bank since I have to own all of the colors and replenish!! This is another really good tip-off! You are always sharing new things with us and most of them are really useful! I Have been trying this for the last few days since I read this post, and I have to say it works great. I use the neutrogena healthy skin makeup with my colorstay, and it gives me the nice dewy finish but with more coverage. Thanks!! !